Here you can see some old photos from Vallejo Speedway's Hardtop division, as well as some old newspaper clippings. Vallejo Speedway ran from the early 50's though 1979. The track was located in Vallejo, Ca. and ran everything from the Modified Hardtop division to Super Stocks to Hobbies, as well as Sprint cars, Super Mods, and the ever popular Midget cars. What started out as a page on my other web site has evolved to the point that I felt it needed it's own main site. I hope you enjoyed these pages. I'd like to thank Don O'Keefe Sr., Danny Hendricks, and Megan O'Keefe for supplying the first photos and information that helped make this site possible. Most all of the photographs on this site I believe were taken by Bob Bockover who was the track photographer. More photos from Ken "The Hardtop Hunter"
Here's the only photo left of my Dad with his last hardtop. They ran this car all over the valley . 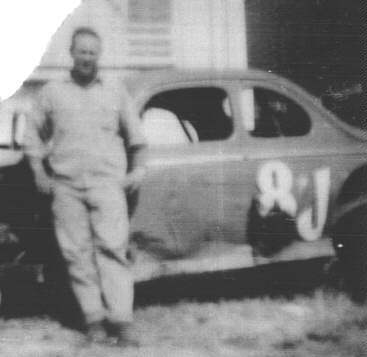 When Dad wasn't driving it he had a driver I believe his name was Brice Meyers behind the wheel. The car was a 1946 Ford with a Ford flathead in it. They ran it on dirt and asphalt. I hope we can help keep these memories alive by having these photos of our past on the web. Veteran BCRA midget & 360 sprint car driver Ray Derby sent us this photo taken at Pacheco Speedway in 1959 by the lengendary lensman Bob Bockover. 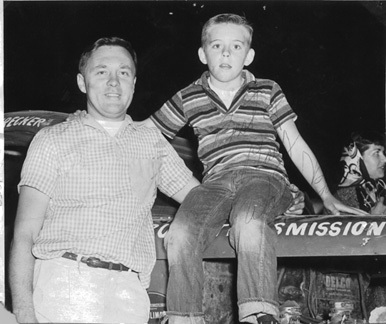 That's a young Ray sitting on the hood posing with Wally "Crazy Wheels" Baker for the camera. Ray states that this is his favorite hardtop photo... thanks Ray for sharing this memory. A big thanks to all that have contributed photos and memories to this site. 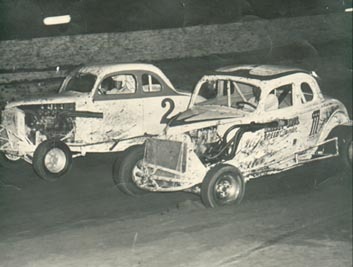 What started out as a few photos scanned from an old Vallejo Speedway program late one night has turned into this site. There are alot more photos and information that I have yet to scan and update so please forgive my slowness. Keep the photos and info coming I'll get to it sooner or later. I may even expand this site to an upgraded server. Thanks again, Don O'Keefe Jr.
Well I've finally decided to stop any & all updating on this site. Between life issues, web issues & such, plus that fact that Bob Manzer's Vallejo Hardtops site is up and hitting on all cylinders +, it's time for any contribution I may have made to end. 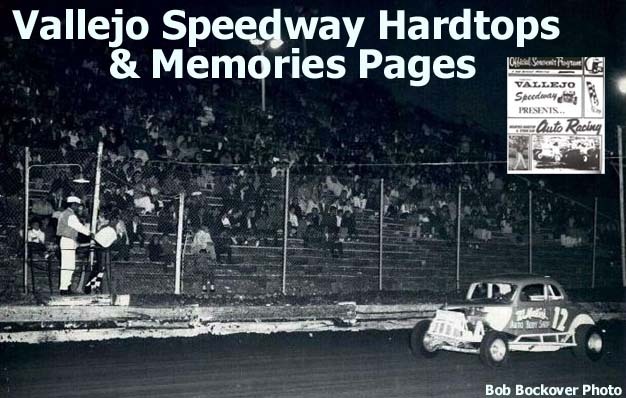 Bob Manzer has put up much of his photos and welcomes any contributions, photos, driver info, or whatever you may have interesting about the old speedway. Hope at least some of you enjoyed what was started over 10 years ago. 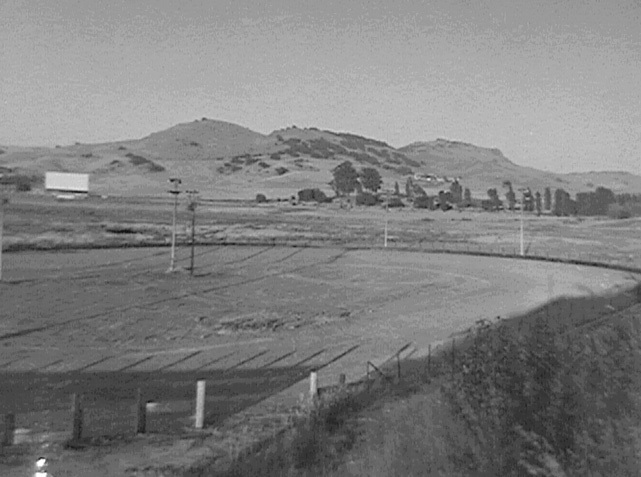 Thanks to any & all who contributed to this site and made it what it was/is, the 1st Vallejo Speedway site. Make sure to check-out the LOK Enterprises site for more info about our race team. Tommy Thomson Vallejo Speedway Nor-Cal Hardtop Fresh From The Paint Booth!